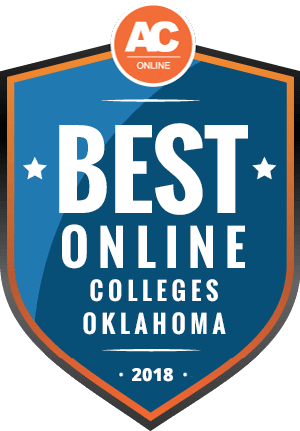 Why Choose Oklahoma for Online Higher Education? As educational attainment in the United States has increased, so too increases the demand for an educated workforce. According to the Census Bureau, in 2017, 55.4% of the population over the age of 25 completed high school and/or some college, and 34.5% graduated with a bachelor’s degree. A report published by The Georgetown Center on Education and the Workforce predicts that by 2020, more than 65% of jobs in the US will require a postsecondary education. In Oklahoma, more than 64% of jobs will require a postsecondary degree by 2020. Getting a college education now can significantly buoy job prospects in the near future. Oklahoma provides a variety of affordable online colleges that make it possible to obtain an online degree while balancing family and work obligations. A midwestern state with a rich history and diverse landscapes, Oklahoma also offers 62 completely online higher education programs. These programs vary widely in their breadth and appeal to residents and non residents of the state as well as international students. In 2016, 115 international students enrolled in exclusively online programs at Oklahoma schools. Online education not only accommodates distance, but also allows for flexibility of scheduling often needed for single parents, full-time workers, and underserved populations. If you are looking to obtain a college degree but have other obligations or location restrictions, an online program in Oklahoma may suit your needs. In general, the cost of attending college in Oklahoma decreases for in-state students compared to out-of-state students. According to the National Center for Education Statistics, out-of-state students in Oklahoma generally pay more than twice the amount that in-state students pay at public two- and four-year institutions. Some online programs include a nonresident tuition waiver program ,and most online programs waive some of the mandatory university fees associated with using the university’s physical facilities. In addition, out-of-state students living in neighboring states may be eligible for reduced tuition rates through reciprocity agreements. Out-of-state students may also decide to establish residency in order to be eligible for in-state tuition later. Oklahoma’s tuition ratest are much lower than the national averages of $8,778 for in-state tuition and $24,354 for out-of-state tuition. Most online programs cost roughly the same as their on-campus counterparts, though discrepancies in fees vary from institution to institution. While attending an online college in Oklahoma as an out-of-state student tends to be more costly than for in-state students, plenty of reasons exists for nonresident students to choose a program in the state. In 2016, 3,343 out-of-state students studied exclusively online in Oklahoma. Nonresident students should be aware of reciprocity agreements with other states and programs or good neighbor discounts in order to reduce costs. Institutions may also offer tuition waivers or scholarship programs specifically for out-of-state online students. Oklahoma belongs to the Southern Regional Education Board (SREB), a nonpartisan organization dedicated to improving public education with 16 participating states. The SREB offers a tuition-savings program called the Academic Common Market, which allows students to pursue degrees at out of state institutions but at in-state costs. To qualify for the Academic Common Market, a student must reside in one of the SREB member states and gain admission to an approved academic program. Academic Common Market includes nearly 2,000 different undergraduate and graduate programs and ten participating institutions in Oklahoma. Oklahoma participates in the State Authorization Reciprocity Agreement (SARA), which establishes national standards for distance education course offerings across the United States. SARA facilitates the process of taking online courses offered by an institution outside of a student’s state of residence. Oklahoma is home to 35 SARA-approved institutions. Choosing an appropriate online degree program is a personal decision and the right choice varies from student to student. The following guide provides a ranking of Oklahoma’s best affordable online colleges using metrics such as price, student-teacher ratio, breadth of courses offered, percent of incoming students receiving financial aid, and availability of job placement services. Feel free to use this list as a starting point for finding a school that meets all of your criteria. Still have questions about the right online college? Here are some commonly asked questions concerning online programs in Oklahoma, their answers, and a few resources to point you in the right direction! Do online credits cost more or less in Oklahoma? In general, online credits in Oklahoma cost more than regular tuition for residents of the state. For instance, at the University of Oklahoma, undergraduate resident tuition per credit hour is $159.60 while tuition for an online self-paced course costs $180.00. Similarly, at Northwestern Oklahoma State University, tuition for an undergraduate Oklahoma resident is $212.75 per credit hour while online tuition for an undergraduate equals $305.25. These figures constitute tuition cost alone and do not include fees for on-campus facilities, meal plans, and technology fees that usually accompany on-campus tuition costs. Online tuition for out-of-state students is usually more expensive than for in-state students. Some programs may offer a tuition waiver program or scholarships for out-of-state students taking online courses. Northwestern Oklahoma State University provides a tuition waiver program for online students who are not residents of Oklahoma. Which Oklahoma schools accept the most transfer credits? Most Oklahoma schools accept transfer credits from another regionally accredited university. However, some courses may transfer as general education credits that meet degree program requirements while others transfer as electives. It is always a good idea to ask about the transfer equivalencies at the university you’re looking to attend. Students may also want to compare major-specific requirements across universities as well because a course required by one college for a major may not be required by another. Some schools partner with a community college or another university to make transferring even easier. For instance, Northwestern Oklahoma State University provides a bridge program with Northern Oklahoma College (NOC), where students of NOC can easily transfer into Northwestern Oklahoma State. Will any online colleges in Oklahoma accept a GED? Yes, most online colleges in Oklahoma accept a GED in place of a high school diploma. Most college applications require high school transcripts but accept a GED certificate. Keep in mind that institutions also often require test scores like the SAT or ACT. Rogers State University, for instance, requires a completed online application, an official high school transcript or GED certificate, and ACT scores. How many academic terms per year do online colleges in Oklahoma offer? No, generally no online colleges in Oklahoma start every week or every month. Most online colleges operate on a semester system, with three semesters per calendar year. Even asynchronous courses usually begin every fall, spring, or summer. Exceptions include Oral Roberts University, which operates on a seven-week session schedule. Students at ORU generally take one or two courses per session, with two sessions each semester. In addition, some Oklahoma schools offer self-paced online courses with flexible start dates. The University of Oklahoma’s self-directed online courses allow students to enroll throughout the academic year. All students, regardless of residency, pay in-state tuition for these courses. While students may choose their own start date, each class take 180 days to complete. Which online colleges in Oklahoma will accept the FAFSA? Students who apply for and receive federal financial aid through FAFSA must enroll in a regionally accredited online program. In Oklahoma, the regional accrediting agency is the Higher Learning Commission, so online colleges accredited by this body accept the FAFSA. Are there any free online classes I can take from Oklahoma colleges? Yes, some Oklahoma colleges offer free online classes. Many universities offer open online courses for free to anyone who has internet access. These courses don’t count toward any sort of degree unless students pay tuition and enroll in a degree program. Janux, an interactive learning platform established from a partnership between the University of Oklahoma and NextThought, connects online learners with faculty members and courses at the University of Oklahoma. Learners not currently enrolled at OU can take the course for fun alongside enrolled students taking the course for credit. Third party websites like MOOC List and Class Central also feature free online courses from a variety of universities, including the University of Oklahoma and Oklahoma State University. Students can choose from a course catalog generated by colleges all over the nation, providing access to courses and faculty members in other states. These sites allow out-of-state students to take courses from Oklahoma universities and perhaps even particular faculty members before committing financially. How can I find the online program options at Oklahoma’s colleges? Usually, online degrees at Oklahoma colleges host their own websites with information for prospective and current online students. The University of Oklahoma, for instance, maintains the OU Extended Campus page to gather details about all their online programs, including application deadlines and financial aid information. The OU Extended Campus also offers non-degree programs like the Osher Lifelong Learner Institute designed for learners over 50 years of age to access noncredit courses for a yearly membership fee of $45. The NIADA Foundation offers both a national scholarship and four regional scholarships annually. While the national scholarship tailors toward students either enrolled in or planning to attend Northwood University’s automotive industry program, NIADA regional scholarships are awarded to students who demonstrate excellence in leadership, education, and service. The Oklahoma State Regents for Higher Education established the Future Teachers Scholarship program to encourage the training and development of teachers in order to fill a shortage in public schools. Students interested in obtaining a degree in education should apply for this scholarship. Created in honor of Jimmie L. Dean, a lifelong Oklahoma resident, the Jimmie L. Dean Scholarship provides support for residents of Oklahoma planning to attend an accredited college or university in Oklahoma who intend to stay in the state after graduation. Oklahoma Goodwill Industries established the Abilities Scholarship to help students with disabilities attain their educational goals. Candidates must be a graduating senior at an Oklahoma high school, have a minimum 3.0 GPA, and provide written documentation of a disability. PLFAG is a national organization that advocates for LGBTQ+ equality. The PFLAG Norman chapter offers an annual scholarship to a resident of Norman, Oklahoma who is either LGBTQ+ or a straight ally passionate about advocating for LGBTQ+ rights and plans to attend an accredited postsecondary program.